What Goes Into MY Hand Luggage?.. Understandably, everyone is different and what one person takes in their hand luggage, may be different to what someone takes. I love being nosey and hopefully you guys too, so you'll enjoy this post? I wanted to share with you what I take with me and who knows, maybe it'll give some of you some ideas? Okay so with most airlines, you're allowed to take some form of hand luggage. Please be sure to double and triple check your size allowance before you go and fill up the biggest bag you can find! Every airline is different. Easyjet is an airline we often fly with and they happen to be one of the companies that only allow the smallest sized case/bag. They can be pretty strict and if the flight is a busy one, they wont be lenient if your bag is even just a cm out! Underwear - I usually have a bra on anyway, so don't bother to take up space by packing another one. By underwear I mainly mean 2/3 knickers. Swimwear - You don't want to be the only one sitting around the pool in clothes do you? Those legs aren't gonna tan with clothes on! Dress or Shorts/Top - I don't know about you lot, but on holiday I try to wear as less as possible. So during the day when walking around, I just tend to throw a dress over my swimming costume, or a pair of shorts. Evening Outfit - Now again, remember this is hand luggage, so try not to pack anything too extreme or bulky. A nice maxi dress, or chiffon trousers and a top maybe? PJs - If you sleep naked, then that's one less thing for you to pack, but if you're like me and you have to wear something, don't forget your jammies :) for hand luggage I usually pack a thin nightie. Laptop - I wouldn't risk leaving my laptop in my suitcase whether it got lost or not. So this an item I will always have close by. Makeup - Not my full makeup bag, usually just some bronzer, mascara, and a favourite lippie/gloss. (remember there are restrictions with liquids in hand luggage, so just make sure they're under otherwise they'll go in the bin)! Hair Straighteners - Unfortunately I don't have naturally straight, or curly hair. Mines just a mess if I don't do anything to it once its washed, so straighteners are an essential for me. Deodorant, mouthwash, and/or toothbrush and paste - Remember it has to be the small bottles under 100ml, but it's always nice to freshen up if you've been travelling a while, or are on a long haul flight. Earplugs - My ears pop bad on a flight, so I have to make sure I have earplugs in during take off and landing to prevent them popping. Neck Pillow - For catching some Zzzz! Book/Kindle or sometimes I use iBooks on my phone. Then all your general basics like: Phone, Passport and documents, Money, Camera, Glasses, Sunglasses, Chewing Gum, Earphones etc. go in a small across the shoulder bag (that would squeeze into my hand luggage (IF) they asked me to do so, which they do sometimes ask on an Easyjet flight). What do you take in your hand luggage? 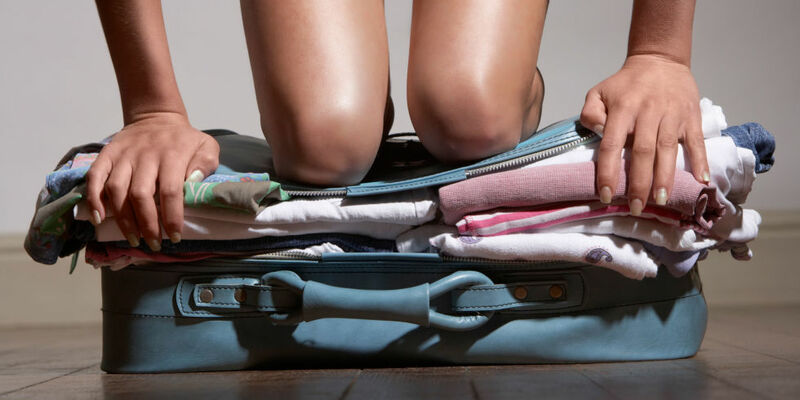 Do you take a carry on case for hand luggage? Or do you just take a small handbag? I always take way too many spare pairs of everything :'D and inevitably never use them all!